This Library for StoryBoard Quick & Artist is what you've been looking for to add extra expression to your storyboards! Disguises have colorable, rotatable masks, hats, glasses, facial hair and expressions that match your built-in characters. 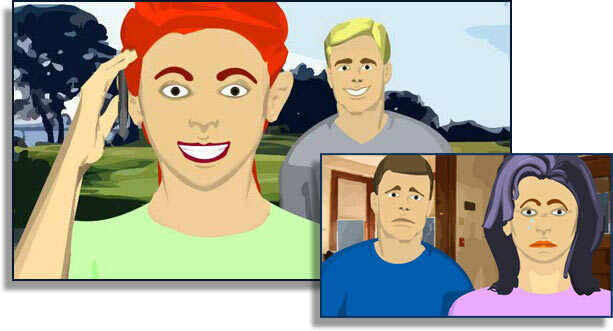 Now Quick can have characters with facial expressions too like Happy, Sad, Laughing, Angry, Crying and more. When you need add some comic relief or add a facial expression for that critical closeup... Grab them, place them, even colorize them and then in an instant, you're done. So add this new Library to your StoryBoard Props today! Get This Cool New Library Today! 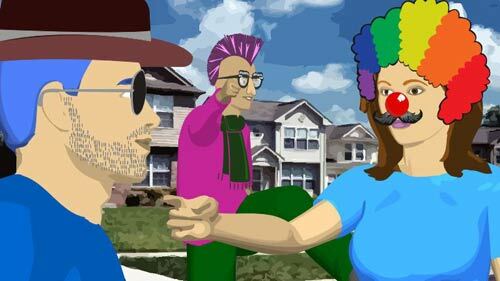 Disguises graphics will enhance your storyboards with comic relief when a character whips out a funny nose or the clown wig! Add a scarf or even a mohawk to your characters, the Disguises help you create a great-looking shot! The new Disguises & Facial Expressions Library is the perfect expansion for your StoryBoard Quick nd StoryBoard Artist apps and is easily accessible through your Props Library Palette!